If there’s one spice (in fact spice mix) associated with Morocco it is Ras el Hanout. Take a walk down any market street in Marrakech or Essaouria and you’ll struggle to walk 10 yards without seeing someone selling it. They’ll tell you that theirs is better than the guy next to him because of x y z or the alignment of the stars. Every one of the sellers say it is a blend of 35 spices – but I think it’s more likely to be 10. Truth be told I didn’t buy any in Morocco. I have plenty and I simply didn’t trust the sellers. We were ripped off enough times for me to just rest assured that I can get perfectly good stuff at home and probably for half the price. We eat wraps a lot. Mainly on gym days. After a 90 minute drive home from work and a 90 minute plus gym session its just too late to start cooking. So unless you’ve got leftovers, wraps are a great alternative. Typically our wraps are salad and grilled halloumi, but I stumbled across this recipe in Persiana by Sabrina Ghayour so I decided to try something different. Like most things in this book it’s pretty easy. You create a paste with the ras el hanout and some olive oil, then smear it all over some chicken strips. I did mine in a plastic freezer bag as you can squish all the paste into all the surfaces of the chicken and it doesn’t stink out your fridge while you leave it to marinate. The book recommends leaving the chicken to marinate overnight (I’ve done this subsequently and it does make a big difference) but on the first occasion I left it less than an hour – I was hungry! While your chicken is marinating, make the yoghurt dressing by simply mixing chopped mint, greek yoghurt, black pepper and sumac. Sumac is amazing. It lifts everything. Its a ground berry from the Rhus plant – and it tastes fantanstic. Sprinkle it on bland looking stuff and it’ll make it look pretty too! When you’re ready to eat, fry off the chicken until it’s springy and when it’s done let it rest for a few minutes on a board. 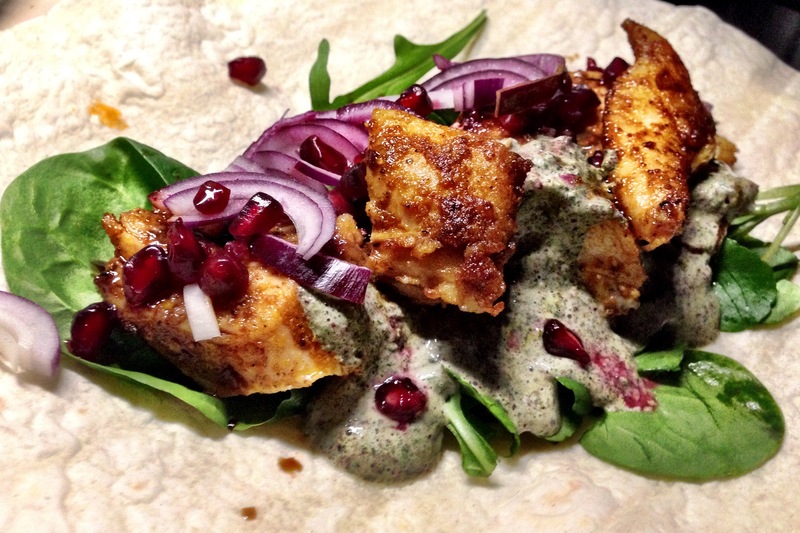 Then simply construct the wraps with some rocket leaves (or spinach like I did), the chicken, some sliced red onion, the yoghurt dressing, some pomegranate molasses and some pomegranate seeds. You won’t eat a better wrap. It’s good if you can dry fry the wraps first to warm them through – your filling will stay warmer for longer and it’ll be easier to wrap the wrap! I really love these. And I make them all the time. It’s why you don’t see me blogging much these days – too many of these awesome wraps! This entry was posted in chicken, persiana, sabrina ghayour, wraps and tagged chicken, pomegranate, ras el hanout, wraps by tenuoustoaster. Bookmark the permalink.